Who is Committed to Opposing Dukes Pipeline – Golf Manor? In addition to the local safety issues, I oppose the pipeline due to concerns that this new delivery system will increase investment in fracking in northern Ohio and the danger that poses to our aquifers. Consider this information when making your voting decisions. NOPE does not endorse specific candidates. However, we encourage everyone to be informed about where candidates stand on issues that are important to them and to vote accordingly. Help us fill in the missing information! Ask your elected officials and candidates to respond to NOPE’s questions about their position on Duke’s pipeline, if they have not done so. CLICK HERE for the questionnaire or copy this URL into your browser: https://goo.gl/forms/67wnq0A5lrsGy9Xh2. It will take 2-3 minutes to complete. Hold your officials accountable to the positions they have taken on the pipeline, in the future. This entry was posted in Central Corridor Pipeline, Government on October 27, 2017 by Elizabeth Rueve-Miller. 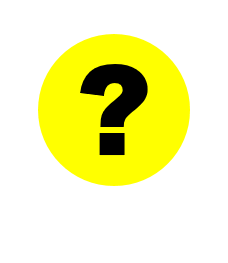 Who is Committed to Opposing Dukes Pipeline – Sycamore Township? Sycamore Township has been fully engaged in opposition to this. Sycamore Township has been vocal and consistent in its opposition to all three proposed routes, all of which would affect our residents and businesses negatively. The Sycamore Township Trustees were one of the first elected officials to announce that we were gooing to intervene in opposition to the Duke high pressure pipeline. As you probably know, regardless of the path that is chosen, Sycamore Township has the pipe going through their community. WE ARE OPPOSED TO ALL OF THE PATHS PRESENTED. WE WILL CONTINUE TO FIGHT IN OPPOSITION TO ALL PROPOSED PATHS. Ask your elected officials and candidates to respond to NOPE’s questions about their position on Duke’s pipeline, if they have not done so. CLICK HERE for the questionnaire or copy this URL into your browser: https://goo.gl/forms/67wnq0A5lrsGy9Xh2. It will take 2-3 minutes to complete. Here is contact information from the Hamilton County Board of Elections. 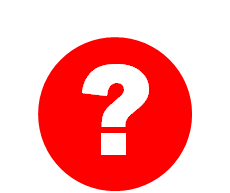 Who is Committed to Opposing Dukes Pipeline – Columbia Township? Here is contact information for candidates from the Hamilton County Board of Elections. Who is Committed to Opposing Dukes Pipeline – Reading? I HAVE Opposed the Pipeline from the very start and will continue to do so. I along with several Reading Officials have attended almost all of the NOPE sponsored meetings and those hearings put on by Duke. I will forward any additional information provided by your group. Thank You !! This entry was posted in Central Corridor Pipeline, Uncategorized on August 18, 2017 by Elizabeth Rueve-Miller. In case you missed it, last Friday was National “Call Before You Dig” Day. Many utility companies, including Duke, used this as an opportunity to remind people to call 811 forty-eight hours before beginning any kind of excavation work. 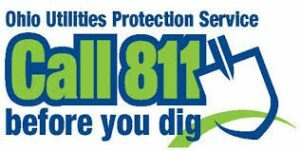 The goal of the 811 “call Before You Dig” program is to help people avoid damaging underground utilities, including natural gas lines, during digging activities. If you call 811, the local utility company or one of their contractors will come out and mark the location of underground utilities within 48 hours. While we wholeheartedly encourage effective programs that reduce the risk of an accidental pipeline rupture, results from a recent study published by the Common Ground Alliance are disappointing. Not only is 3rd party damage to natural gas pipelines increasing, most of these accidents were not caused by a failure to provide notice. 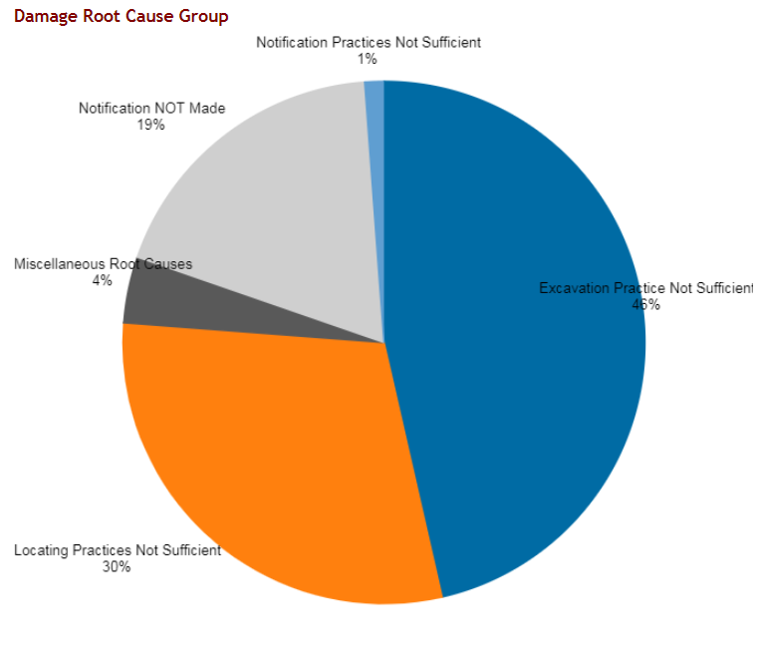 Most of these incidents were caused by were caused by insufficient practices in excavation (46%) or location (30%), rather than failure to call before digging. 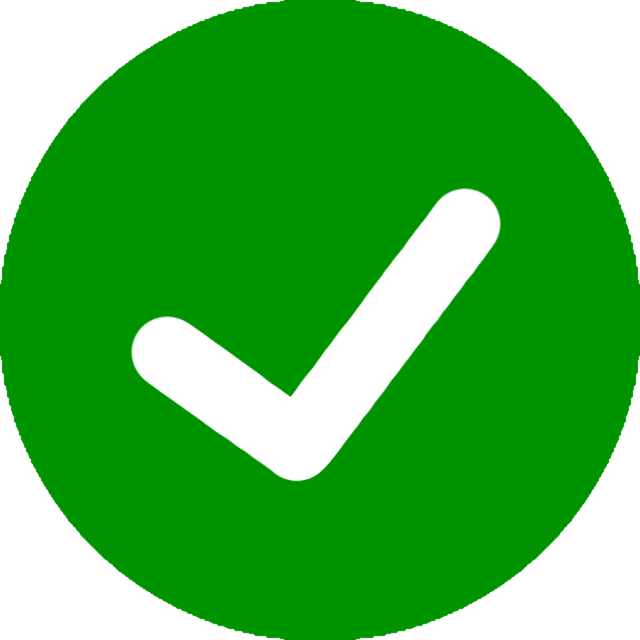 Nineteen percent were caused by failure to notify 811. While Duke cannot control contractor excavation practices, they can impact the location of new pipeline infrastructure. Duke should not knowingly put high-pressure pipelines in densely populated areas when there are significant gaps in safety mechanisms. In the interest of transparency and public safety, Duke should conduct a complete risk assessment and share this with our local municipalities. 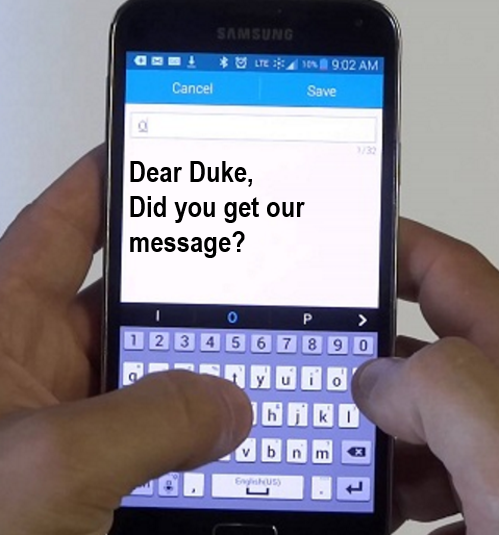 If Duke does not do this voluntarily, the Ohio Power Siting Board should insist upon it. This entry was posted in Central Corridor Pipeline, safety, Uncategorized on August 18, 2017 by Elizabeth Rueve-Miller. This entry was posted in Downloadable Materials, Education & Information, Things You Can Do, Uncategorized on June 7, 2017 by Elizabeth Rueve-Miller. Download and fill in your own personalized pipeline opposition letters. 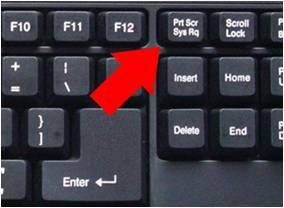 Feel free to personalize your letter, but please retain wording on the key information. We make every effort to remain consistent in our language when communicating with the public. Once you have personalized and sent your letter, please send a copy to [email protected] by either copying and pasting it into an email or sending as an attachment. This will help us track where the letters have been sent, and lets us know who still needs to be reached. Use our mapping tool to help businesses, organizations and individuals determine whether they are vulnerable to Duke’s pipeline in the event of a disaster. Questions? Feel free to contact Tammy Reasoner at [email protected], and I’ll be happy to walk you through the process! This entry was posted in Downloadable Materials, Things You Can Do on February 12, 2017 by Elizabeth Rueve-Miller. IMPORTANT! If you live in Hamilton County, look for a plain white 4″ X 6″ piece of mail like the one pictured above. 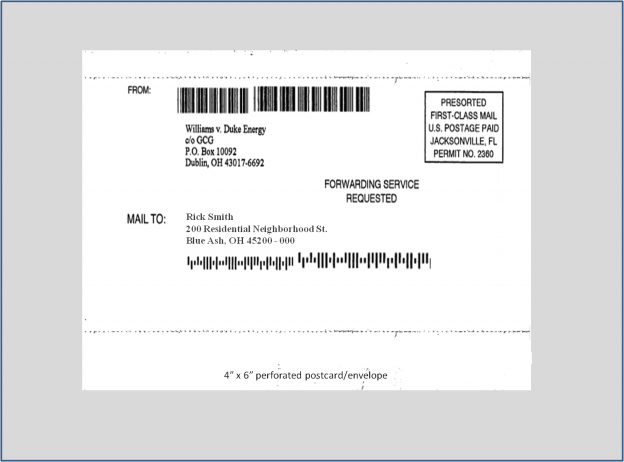 In the upper left-hand corner, in tiny print, the return addressee is “Williams v. Duke Energy.” Don’t throw this envelope away! It contains a settlement check from Duke. The people we have spoken with have received checks for roughly $140, although the amount may vary. Why is Duke issuing checks to customers? Duke is sending settlement money to customers as a result of the class action lawsuit — Williams et al vs. Duke Energy Class Action Suit. In that suit, it was alleged that Duke Energy Ohio violated federal racketeering and antitrust laws, as well as state racketeering and common law claims. Duke denies these allegations, and maintains that they did not engage in any wrongdoing. Duke agreed to pay an $81 million settlement. For more details, see http://dukeclassaction.com/. I received my check. Now what should I do? Of course, you can cash the check and spend the money in any way you like. But in light of Duke’s plan to run a high-pressure natural gas pipeline straight through densely-populated areas, please consider allocating your settlement check to NOPE. We do not believe a pipeline of this size and scale belongs in any of our densely populated residential areas. If an accident were to occur, the consequences could be devastating. NOPE is working to make sure that does not happen! Your settlement check would not only support our legal efforts but could also send an important message to Duke: Invest in keeping our families and communities safe. This entry was posted in Things You Can Do on February 9, 2017 by Elizabeth Rueve-Miller. Many Duke Customers will receive legal settlement checks in the coming weeks. If you have received a check, please consider donating these funds to NOPECincy’s pipeline opposition efforts. Duke does not seem to be responding to concerns of the people they are supposed to be serving. Make your concerns and objections LOUDER. Leverage your financial support, in a way that will make Duke take notice. Use Duke’s settlement checks to help support NOPE’s pipeline opposition intervention case. Our goal is to raise $50,000 for legal fees, expert witnesses and continuing to and advocate for all of our communities and citizens impacted by the pipeline. Thanks to your contributions, we are about halfway to our goal. According to dukeclassaction.com, the Residential Settlement Fund could be as much as $25 million dollars. All we need is 0.5 percent of those funds to reach our $50,000 goal. Residential customers are expected to receive $40-$400. Several residents we spoke with received $140.87. If 200 people signed over their settlement checks to NOPE’s opposition fund, we could meet our goal. Please be one of them! Watch for the check in the mail. 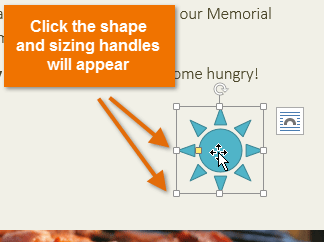 It may be easy for you to miss, as several people have commented that it looks like junk mail. HERE is what it looks like. Endorse the check by signing the back and adding “pay to the order of NOPE, LLC”. HERE is an example.